Total War Funding: To date, $1.57 trillion has been allocated to fund the wars in Iraq and Afghanistan, including $92.3 billion in fiscal year 2014. Iraq: To date, $815.8 billion has been allocated for the war in Iraq since 2003, including $3.2 billion in fiscal year 2014. Afghanistan: To date, $753.3 billion has been allocated for the war in Afghanistan since 2001, including $89.1 billion in fiscal year 2014. Military Action Against ISIS: The military conflict with ISIS started on June 16, 2014. So far, funds for the conflict have come from war funding allocated for Iraq and/ or Afghanistan, and are included in spending on those conflicts. These totals are based on appropriations that provide funding through the end of fiscal year 2014. 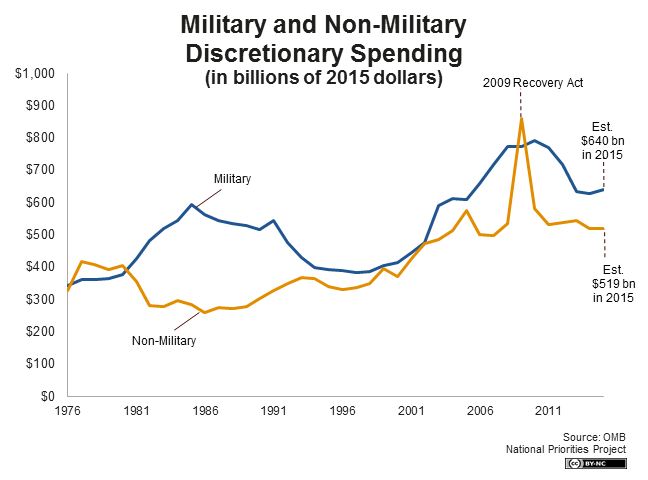 These figures include both military and non-military spending, such as reconstruction. Spending includes only incremental costs – those additional funds that are expended due to the war. For example, soldiers’ regular pay is not included, but combat pay is included. Potential future costs, such as future medical care for soldiers and veterans wounded in the war, are not included. These figures also do not include interest payments on the national debt that will result from higher deficits due to war spending. 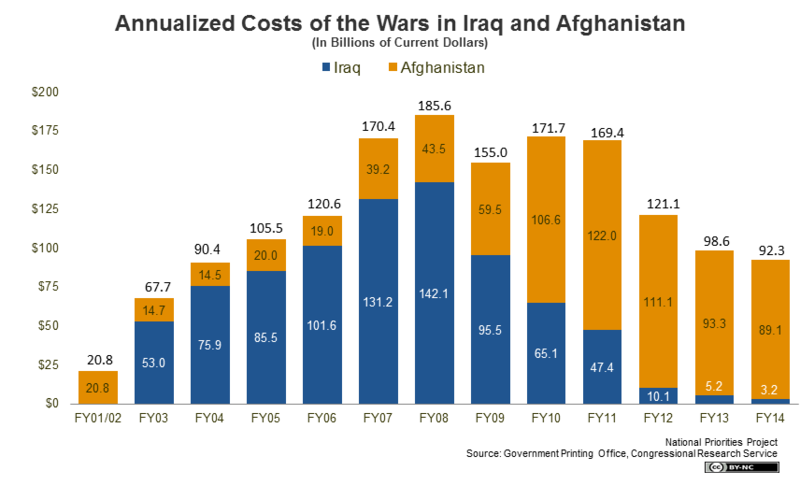 Total war funding, and costs of war in Iraq and Afghanistan, are based on analysis of legislation in which Congress has allocated money for war, as well as research by the Congressional Research Service. Cost of military action against ISIS is based on news reports of Pentagon cost estimates. Key Fact: In fiscal year 2015, military spending is projected to account for 55 percent of all federal discretionary spending – that’s the portion of the federal budget that the president requests and lawmakers determine each year in the appropriations process. Military spending will account for 16 percent of overall federal spending in 2015. U.S. military expenditures are roughly the size of the next nine largest military budgets around the world, combined. President Obama’s 2015 Budget: The president has requested $555 billion in discretionary spending for fiscal year 2015, including $60 billion for war funding, officially referred to as “Overseas Contingency Operations” (OCO). Billions of dollars in the war budget have been widely referred to as a “slush fund,” because they provide the Pentagon with a relatively flexible source of funds that has been protected from the cuts made to all other federal discretionary spending. Meanwhile, according to polling, 58 percent of Americans would support substantial reductions in military spending. Military v. Non-Military Spending: In the decade following Sept. 11, 2001, military spending increased 50 percent, adjusted for inflation. Spending on domestic discretionary programs – things like education and public transit – grew by 13 percent over the same time period. War Costs: By the end of fiscal 2014, the U.S. government will have spent $1.57 trillion on the wars in Afghanistan ($751 billion) and Iraq ($817 billion). Homeland Security: Total discretionary military spending of $555 billion includes $16 billion for military expenses for the Department of Homeland Security in 2015. The U.S. also spends money on homeland security that is not designated as military spending, but that includes funding for law enforcement, border control, and other pseudo-military expenses. Non-military Department of Homeland Security discretionary funding is expected to be an additional $43 billion in 2015.